Sixty million years ago, the world belonged to Titanoboa, a gigantic snake that measured 40 to 50 feet long and weighed over 2,500 pounds. Only one creature could challenge it: a newly discovered, twenty-foot freshwater crocodile. The Paleocene epoch was the ten million year period directly following the extinction of the dinosaur. Earth's longtime reptilian overlords were dead and gone, and mammals were only beginning to take over. For this brief geological period, animals generally occupied a smaller scale, with little of the megafauna that defined the age of the dinosaurs and that of the mammalian era that followed. There was, however, one giant exception: the Titanoboa. Its reign of dominance was short - it appears to have emerged about 60 million years ago, and it was extinct only two million years later. But for that brief period, it was the most colossal snake in all known history, averaging well over forty feet long at its adult size. The creature lived in what is now northern South America, dining on fish and enjoying the world's first known rainforest climate. 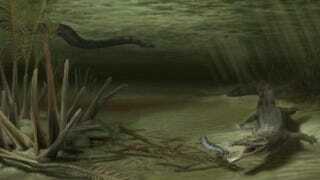 Now, new research from the University of Florida suggests that Titanoboa had some competition. Fossils recently discovered in a Colombian coal mine reveal the existence of Acherontisuchus guajiraensis, an ancestor of modern crocodiles that could grow to up to twenty feet long. That may not sound like a lot compared to a 50-foot snake, but researcher Alex Hastings says this crocodile would have given Titanoboa plenty of trouble: "The younger individuals were definitely not safe from Titanoboa, but the biggest of these species would have been a bit much for the 42-foot snake to handle." Most importantly, this crocodile had teeth specialized for hunting and eating fish. That means it had the exact same diet as Titanoboa, and since they shared the same ecosystem - indeed, that same mine has also been the site of Titanoboa fossil discoveries - conflict between the two species was pretty much inevitable. And if you're a 50-foot snake or a 20-foot crocodile, I'm going to guess you don't easily defer to others. Acherontisuchus guajiraensis also represents a unique evolutionary species. It first appeared 75 million years ago, meaning it's one of the few giant reptiles to survive the extinction event 65 million years ago that killed off the dinosaurs. It and its crocodile cousins - known collectively as the dyrosaurids - were one of the few success stories of this period, thriving in the Paleocene in a way they never had during the dinosaur-dominated Cretaceous. Just generally, this crocodile is unlike any other we've discovered. It has a long snout, and most such crocodile species lived out in coastal water, but Acherontisuchus guajiraensis preferred a freshwater environment. Previous crocodile discoveries from this era show a more generalized diet, but this one was specifically adapted to eat fish. And, like all other dyrosaurid species in South America, it had swum across the Atlantic from its evolutionary birthplace in Africa. You know, if I didn't know better, I'd say this species went out of its way to pick a fight against Titanoboa. I doubt that's an accurate reading of evolution, but it's too awesome a possibility to ignore. So here's to you, Acherontisuchus guajiraensis, the only species to ever evolve specifically so that it could fight over food with a fifty-foot snake. You've actually managed to make modern crocodiles look like wimps...not that I'll be saying that to their faces. Via the University of Florida. Illustration by Danielle Byerley.